Really Reasonable Ribbon Blog Hop and Some Candy!!! The colors and patterns in this month's assortment are so pretty!!! 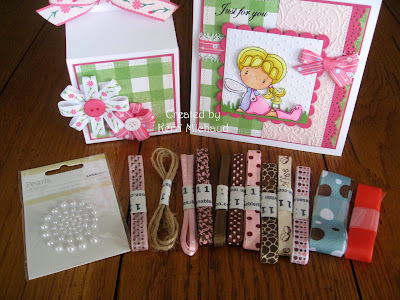 I decided to make a gift set using this fab template from Perfect Presentation called Cute Carton. I decorated the box with some ribbon flowers that I made using Delicate Flowers and Dots and Stripes Grosgrain Bright Pink and I used some Flowers with Scalloped Edge ribbon to tie my box closed. 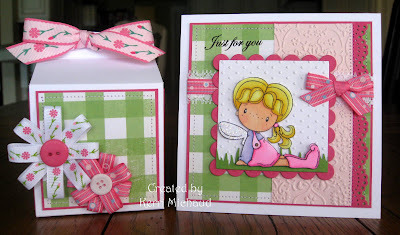 This darling image is C.C.Designs Swiss Pixies Gretel and the sentiment is from the Your Next Stamp set Elegant Greetings. But what good is a gift box without something in it? Papertake Weekly~Something old, Something new... I used my new ribbon and a new to me image:) Lots of old favorites too! Such a great card and the gift bag is really awesome! I love your work! What a beautiful gift-set you made. I sure would love to win this. I became a follower even before i read this post (hihi) - and now ill go "home" and post this pic and a link in my sidebar. Your gift set is awesome! What a cute card a gift! So much fun on this hop! I loooove the ribbon flowers on the box! I am now a follower, thanks for a chance to win! This is a really beautiful set Kerri. I love all the texture. I'm a follower already and would love to participate on this one! Love the ribbons shown. And the card comes with the candy, of course? I'm already a follower. What a wonderful gift candy. Love your work. I came across so much cute work! I just wanted to become a follower because of all the inspiration! Love this work too, Green and Pink are great together! Oh my goodness this is gorgeous and such a beautiful gift. The pink and greens go so well together. Love this gift set ...lovely colors. Became a follower...thanks for a chance to win. Great Project! Beautifull box! I think everyone want to win such a beautifull box!! Sweet gift set and what a fun idea to put the ribbons in the box! What an amazing gift box set and yummy candy! Your set would make a lovely prize on its own but the added goodies make it extra special. Thanks for the chance of winning. AHHHHHH this is soooooo SWEET Kerri I LOVE LOVE your set!!! Fabulous work girly!! Happy Friday!!! big Hugs! FABULOUS project Kerri! That ribbon is so YUMMY!!! PS - Lauren won!!! YIPPEE!! So sweet! I love the color combination and the detail on the box. At first I thought it was a paper cube! Nice work! WOOT HOOT! Kerri, I think there is a photo of this card/package beside the word sweet, in the dictionary. Me Me Me (waving my hand madly) I want to win!!! LOL :) It will be in my sidebar too!! This gift set is just adorable! I'd so love to win it. Looking forward to getting to know you in the future too! I love this color combo! The card is so beautiful. Adorable, LOVE those ribbon flowers. Such a cute little gift set. This is awesome! I love the ribbon flowers...you're such a genius! Your project is fabulous...love the colors. Thanks for the chance to win your blog candy! EEK! Your gift set is too cute! Thanks so much for the chance to win it, I already follow. Have a great weekend. Pinks and Greens are my favorite! SO cute. Your gift set is si cute! Thanks for sharing, please include me in your drawing ! I am just becoming a follower! Am now a happy follower of your blog! :) Love your decorated box and sweet card! Thanks for the chance to win! Oh wow Kerri, I looove your creations!! The papers and color are so beautiful, and so are your flowers! The gift set is absolutely darling. Love the colors. Great box and card! They're lovely. I've become a follower and posted about your candy on my sidebar. Wonderful set. Very cute card. Kerri, This is adorable. Love the layout, colors, everything. Kerri, love your gift project. Those colors are awesome. Tell me someone who doesn't like candy? What a great gift set! I like the flower and bow on the milk carton. Everything is so color coordinated. Thanks for the chance at the blog candy but more importantly, thanks for sharing. That is really beautiful work! OMGoodness!!! WOW! I love this set! It is so cute! Would love to win it,although it is nice with all the stuff, I would even like just the set!!! Kerri, this is fabulous!!! I love the box and card set! The way you mixed all the ribbons is perfect!! thank you for the chance to win your awesome goodies. What an adorable gift set! So cute Kerri! Your coloring and color combo is too sweet! Oooh, what a pretty set! Love the colours and that gorgeous ribbon! All of my favorite colors and I love the way you made flowers out of the ribbons. I love your work you are truly talented and I am so thankful for the chance to win such fabby candy! Thanks for the blog candy chance. Kerri I love your creations! The ribbon flowers on the little box are fabulous! This is just darling. Your coloring is wonderful and such a cute little gift. Kerri, your projects are adorable! They are so cheerful and fun. Thanks for the chance! I hope for good luck! Ribbons excellent! Love your work!! Thanks for sharing this yummy candy. What an amazing gift set, Kerri! I love the ribbon flowers you crated! Adorable gift set! Thanks for offering some great blog candy! Lovely gift set Kerri! Love the ribbons. This is such a beautiful gift set! You are so generous! Oh! And I am a follower now! I Became a follower...thanks for a chance to win. I've been your follower :) Very cute set!! Beautiful candy, thanks for the chance to win. I´m a follower and posted <a href="http://kartenfreak.blogspot.com/2010/08/kerris-candy.html>here</a> about your candy. wow! such wonderful things you hats made it there! I would like to try my luck. Found your blog thru ATS! What caught my eye was the wonderful coloring that you do! So well blended! Well, after perusing thru your blog, I'm hooked on your creations! Beautiful! I like ribbon and I absolutely love what you did with them on this project! Thx for the great idea! Love the gift set! So lovely and cute! Along with some goodies to win, this is just so awesome.